CINCINNATI – Howl at the Moon and Splitsville Luxury Lanes will open inside the former space occupied by Toby Keith’s at The Banks this summer. Howl at the Moon is described as a “high energy live music bar,” while Splitsville will offer hand-tossed pizzas, burgers and gourmet appetizers alongside its lanes. Both locations will occupy the 16,000 square foot space left vacant by Toby Keith’s last year. The two entertainment destinations will have a maximum capacity of up to 800 people. 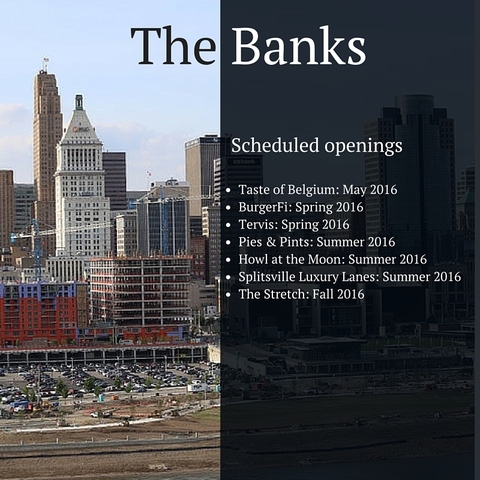 Scott Wilkinson, a Dallas-based manager for the chain of upscale bowling lanes, confirmed with WCPO business reporter Dan Monk that his company was in negotiations for a location at the Banks two weeks ago. For Howl at the Moon, the Banks location will be a homecoming of sorts. The piano bar opened its first location at Covington Landing on the Ohio River in 1990. The new location is the company’s 18th location nationwide.